It doesn't matter how many votes you get in a legislative or congressional election as long as it's more than the opponent. It is possible to win a legislative election with fewer votes than some of the losers. In his 2012 bid to oust state Sen. Wendy Davis, state Rep. Mark Shelton, R-Fort Worth, received more votes than eight candidates who won seats in the Senate that year. But when those eight senators were sworn in, Shelton was back at his regular job as a pediatrician. That election was held with freshly gerrymandered districts of roughly equal population. Even so, the vote totals varied widely by district in legislative races in that presidential election year. 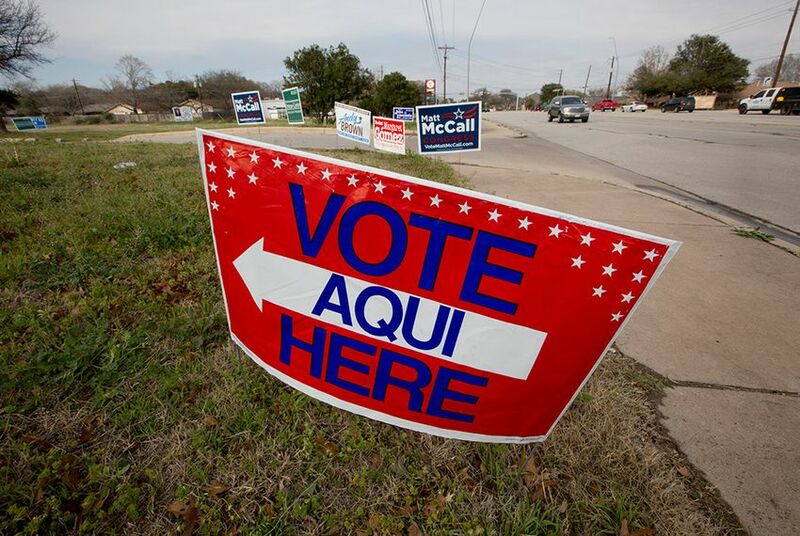 In Senate District 25, which stretches from San Antonio to Austin, 354,167 votes were cast. In Senate District 27, anchored by Brownsville on the state’s southernmost tip, 113,542 people voted. Shelton received 140,656 votes, more than any other losing state Senate candidate that year. It must have been encouraging: He is running again this year for the seat, and is engaged in this month’s Republican runoff. On the other end, Mario Gallegos, D-Houston, won with fewer votes than any other Senate victor. He received 93,289 — about two-thirds of Shelton’s total — and won his last re-election posthumously (he died three weeks before Election Day) with 70.9 percent of the vote. Shelton’s supporters accounted for 48.9 percent of the turnout. Only 16,369 voted in the January 2013 special election to replace Gallegos; a few more, 18,141, came out for the runoff, and Sylvia Garcia, D-Houston, entered the Senate after getting 9,595 votes. This is not confined to the Senate: Candidates can win seats with fewer votes than it takes to lose races for the Texas House and Congress, too. The reason is that voter turnouts vary widely, depending on demographics, citizenship, how the maps are drawn and whether races are competitive enough to attract voters. Senate District 3, the most populous in the state in 2012, had 843,567 people; the least populous, Senate District 28, had 778,341. But look at the differences between populations of voting-age citizens: Senate District 3 had 603,385, while Senate District 6, now represented by Garcia, had 372,420. Even with identical percentage turnouts, one district would have more votes than the other. That is the basis for one argument against the current districts in Texas, but it doesn’t account for the biggest disparity. Texans in one district do not seem to have the same urge to vote as their counterparts in other areas. Sen. Donna Campbell, R-New Braunfels, won in District 25, where 64.6 percent of the voting-age population cast ballots. Hers was one of three districts where more than 60 percent of adult residents voted. Garcia’s district, in that 2012 election, had a 37.1 percent turnout — one of three Senate districts with less than 40 percent. The turnout numbers were low not just because of the low voting-age population — the number who got off their sofas to cast ballots in those districts was also abysmal. Those numbers offer a peek into the design of the political maps drawn by Republican legislators: The districts that turn out the most voters tend to favor Republicans by a wide margin in statewide elections, while the lowest turnouts are typically in Democratic districts. Similarly large disparities show up on congressional and House maps. Nick Lampson, a Democrat who ran in the 14th Congressional District, received 24,583 more votes in 2012 than Democrat Marc Veasey, but they were in different districts. Veasey went to Congress. Lampson went home. This is even more dramatic: Veasey won the 33rd Congressional District seat with 85,114 votes. His colleague Kevin Brady, R-The Woodlands, received 194,043 — more than twice as many. Top-to-bottom differences in the 150-seat Texas House are even bigger. The state representative who got in with the fewest votes that year was Gene Wu, D-Houston, with 15,832. Lyle Larson, R-San Antonio, received 66,679. Ann Johnson, a Democrat who, like Wu, lives in Houston, got 36,480, or more than twice as many votes as he received. Correction: A previous version of this story misidentified Ann Johnson as a Republican. She ran as a Democrat in 2012.